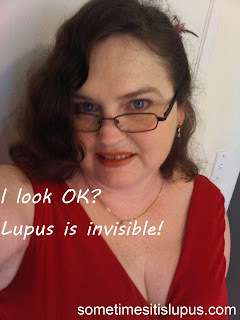 Sometimes It Is Lupus: Oh, I Don't Look Sick? The Health Activist Writers' Month Challenge question for today was about the most outrageous thing anyone has said about my health condition. Well, I've had a few rants about this topic before, so I thought I'd check with some other lupies, and asked on Twitter, Facebook and Google+. I started out by answering each comment individually, but I couldn't keep up with them all. I'm not going to re-post everyone's individual comments, because you'd be reading all day. But there were some definite themes that came through. Let's take a look at some of them. Lupies, try not to get too angry. Remember the people who say these things have no idea what they're talking about. Theme 1 - It could be worse. 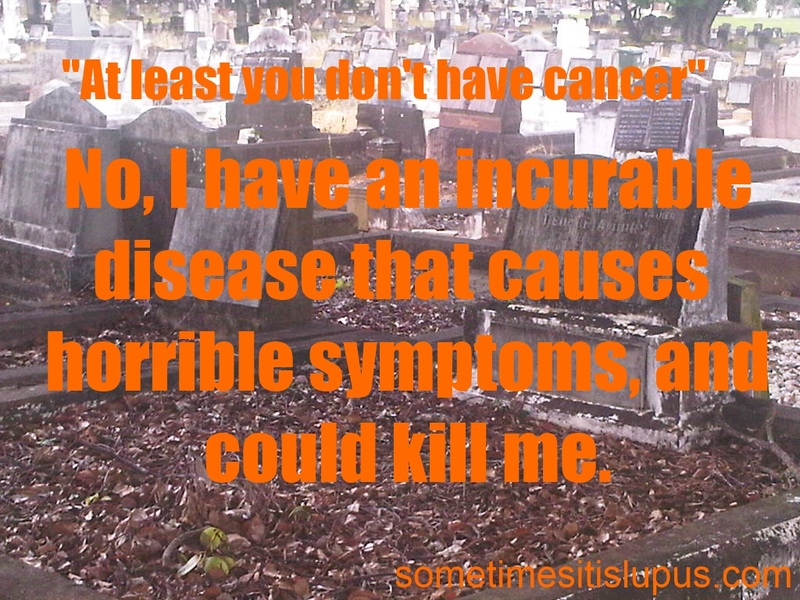 This covers the "at least you don't have cancer", "I know someone who is so much sicker", "at least it's not..... (name any condition you like)" or the one that really got to me someone was told "at least you don't have a chronic illness." Well, do you know what? It doesn't matter what happens to anyone, it could still get worse. You could lose your leg in an accident, and it would still be better than losing both legs. 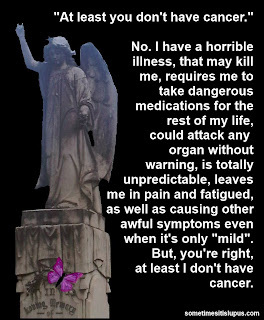 Let me tell you, from personal experience, and from years of hospital chaplaincy listening to patients tell me what upsetting things other people have said to them, and from spending time with other lupus patients - being told things could get worse is not at all reassuring. Many of us are more than aware of the "worse" our particular cases are tending towards. 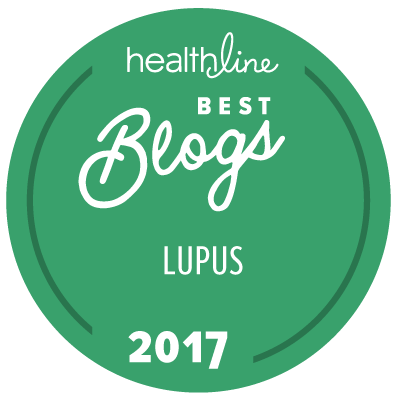 Apart from that, some of the things people think are worse, many lupus patients will actually say they think might be better than what they have. At least I don't have cancer? Guess what? 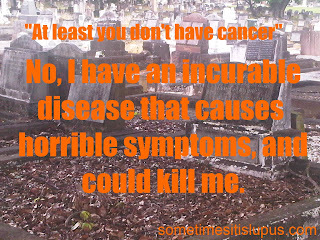 Some cancers are curable - you get horribly sick while it's being treated, but then it's over gone. 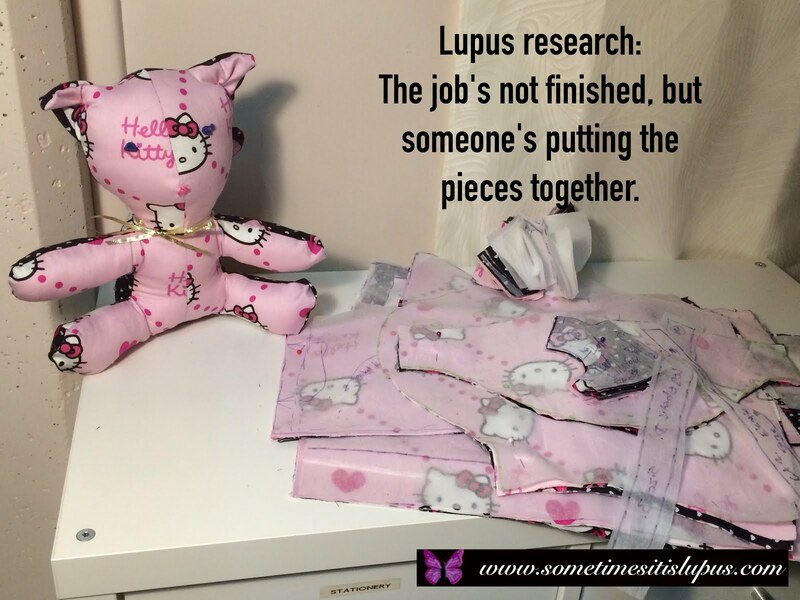 Lupus is incurable, even when it goes into remission, we know it's coming back. 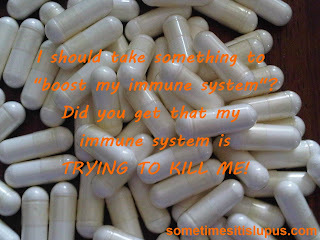 Theme 2 - Unsolicited, uninformed, medical advice. Dr Uninformed and not really a doctor will tell a lupus patient, to give up all those toxic drugs that cause so much harm, and take some "natural" treatment instead. You're really not sick, you need exercise, or rest, or you can't possibly be allergic to sunlight. It's psychosomatic, all in your head. The worst one of all, is "you should take something to boost your immune system" - that's really not a good thing to say to someone whose immune system is trying to kill them. Here's a simple piece of advice to all the would-be advisors: If you don't have medical training, don't give medical advice. 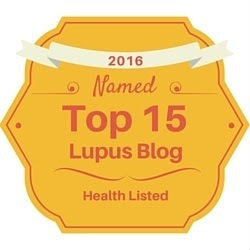 Believe it or not, Lupus patients (and other chronic illness patients) go to highly qualified doctors, usually specialists who keep up with all of the latest actual research in the area. All those toxic drugs we take are dangerous, but they keep us alive. Your supplement, special diet, exercise program, etc, is not going to do the same job as our drugs. Theme 3 - the cure. This is a more sinister version of the uninformed medical advice. 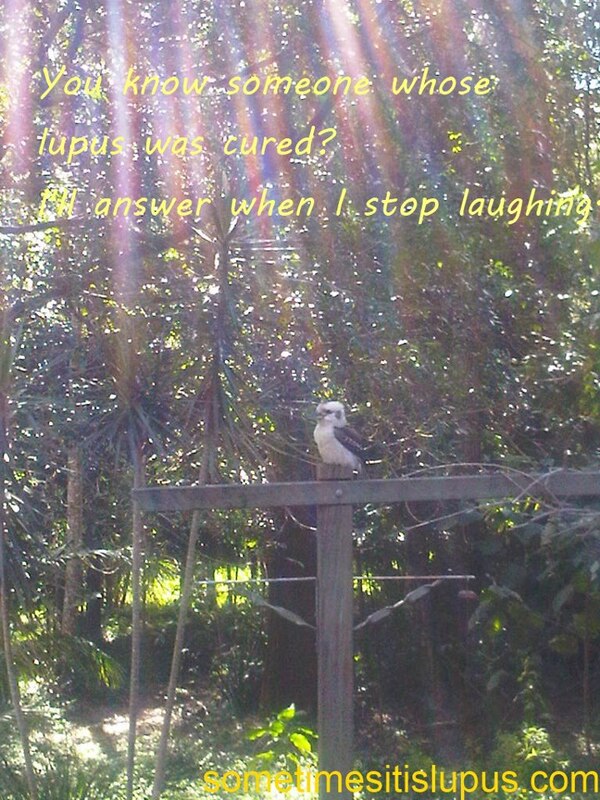 There is no cure for lupus. 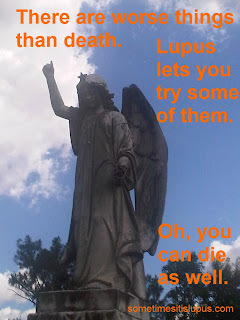 I don't care what you read in a chain email forwarded to you by your cousin's friend's ex-boyfriend's little brother, there is no such thing as a cure for lupus. Trust me, if it were as simple as giving up coffee, or even a blood transfusion, or bone marrow transplant, our doctors would know about it. All those people who promulgate "cures" which have no basis in medical science and research, are risking human lives. 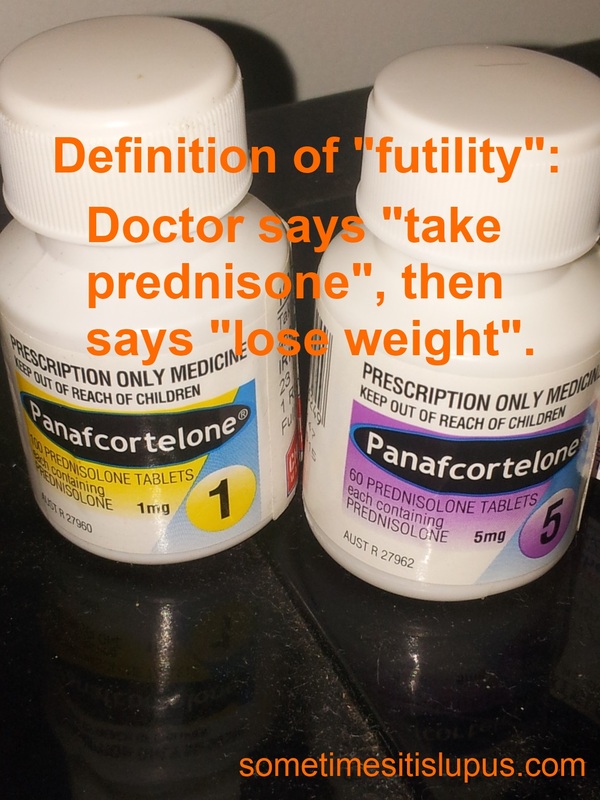 If you convince one lupie to give up their medical treatment for the cure you recommend and they die as a result, do you want that on your conscience? That's what we're dealing with when the snake oil merchants promote their "cures". 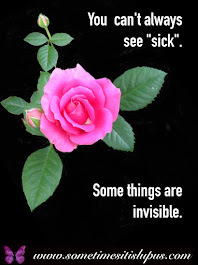 "You don't look sick", and the variables "you're too young to be sick:", "you're too pretty to be sick", "but you look so well" and many similar comments. 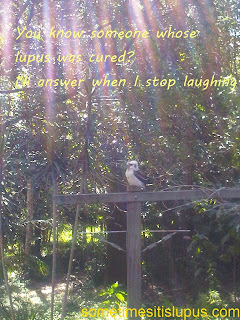 And there was the guy he was told that he couldn't have lupus because he was male (10% of lupies are male). Some of us spend ages carefully working on our make-up to disguise how sick we actually look. And even if we really look great, you can't see our internal organs, you can't see joint pain, you can't see fatigue, you can't see a headache, unless you look in my mouth you can't see the ulcers. If I said I had breast cancer, no-one would say to me, "but you don't look like you have breast cancer." Do you know what a person with a horribly painful chronic illness looks like? Pretty much the same as anyone else. Theme 5 - You're getting some benefit from this. This is related to "you can't be sick" because you look OK or whatever. Again, if someone has cancer, no-one tells them they're just being lazy, employers don't get mad at them for it, nobody tells them they're just seeking attention. 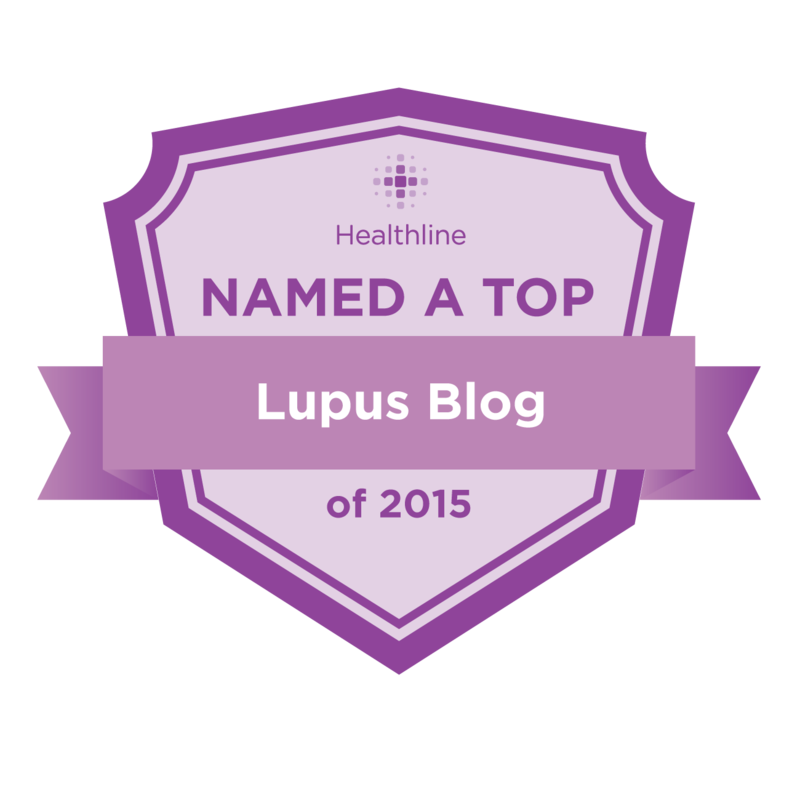 But lupus patients get told all of these things. 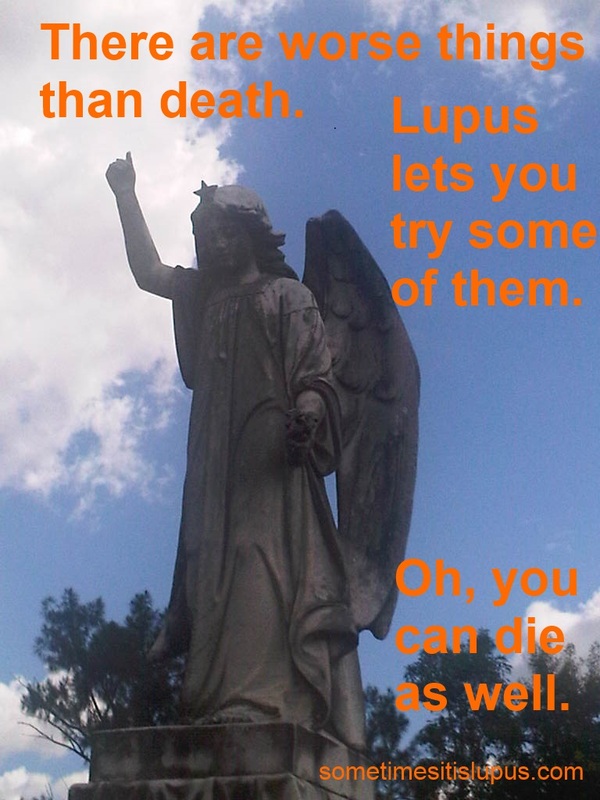 Some people have been known to complain that their taxes are paying lupus patients to do nothing. Guess what? 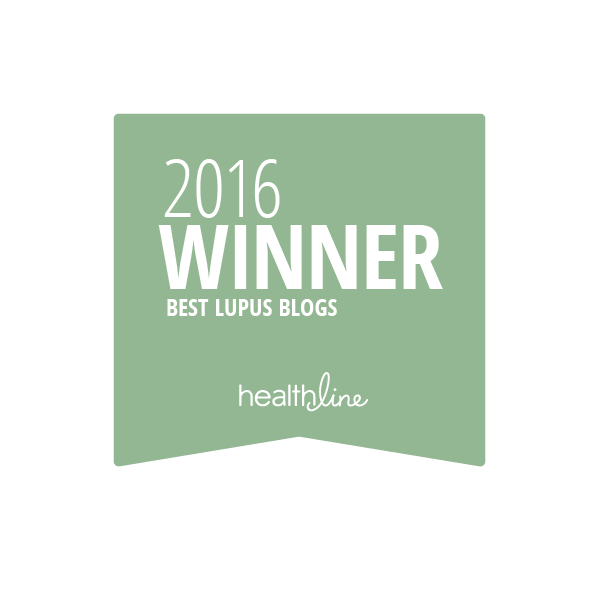 Everyone I know who has had to stop work because of lupus has hated it. We'd all rather be earning our own income. We don't want to be sick. And we don't want the attention of being sick, because being poked and prodded by doctors, examined by xray and ultrasound machines, having constant blood tests, etc is really not as much fun as some healthy people seem to think it is. Theme 6 - You do this to yourself. In a society that still often blames victims of crimes, it's probably not surprising that we blame people for being sick. 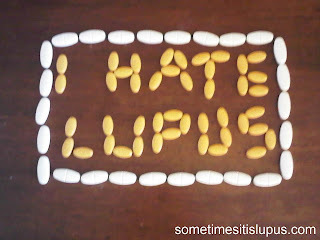 The causes of lupus are unknown. There is no evidence anywhere to support the idea that any of us do this to ourselves. There's no causal link such as there is with say smoking and lung cancer, alcohol and cirrhosis of the liver. There's not even the not-quite-proven but widely medically suspected links like marijuana use and schizophrenia. Theme 7 - You're a burden. I thought I'd heard everything, until I came across some of the things lupies had been told along these lines. "You shouldn't get married it would be unfair." "It will be better for your kids when you die." "I married you because I felt sorry for you." I just asked my 19-year-old son if he thought he would have been better off if I'd died, he said, "No, because then I'd have had to live with Dad and he doesn't even have cable broadband." My son, always practical. Do you know what? 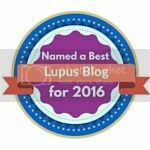 Just because we're sick, doesn't mean people with lupus stop being valuable, worthwhile, human beings. Society has a long way to go towards understanding and being compassionate towards people with disabilities. 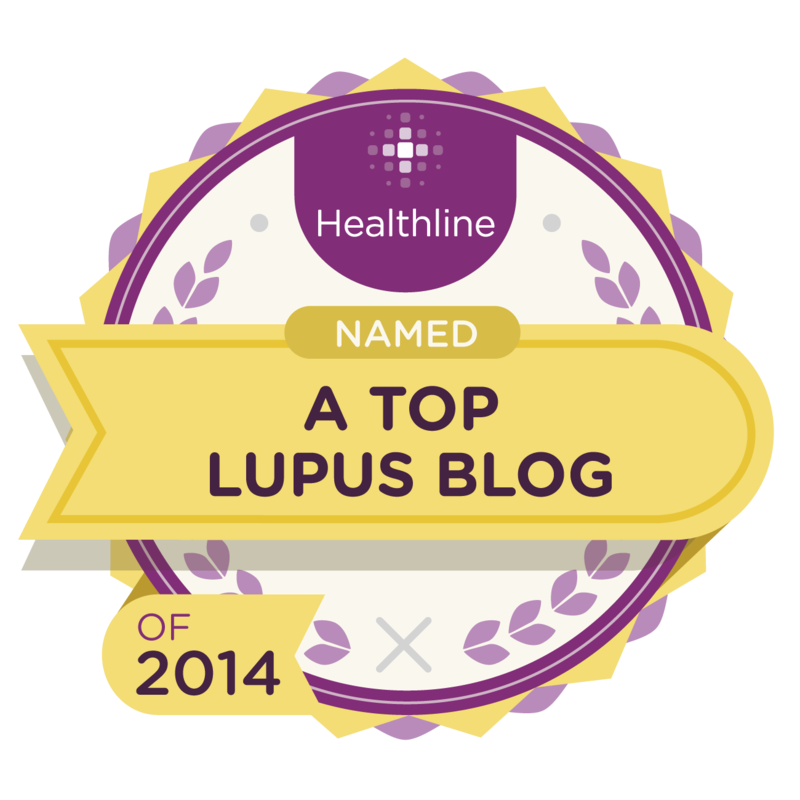 This post written as part of Wego Health's Health Activist Writer's Month Challenge. This is "spot on". The worst thing someone has never said to me, was as they pulled me aside, "did you have botox go horribly bad on your face or are you allergic to it"? 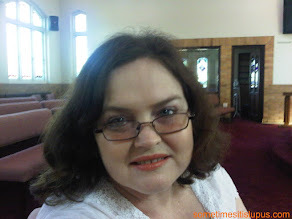 I was on a very high dose of prednisone and my face was swollen. I was stunned! This was a co-worker too. My boss came out of her office and said "what the hell is wrong with you"? I even had portable oxygen on. All I could do was cry until my amazing boss told her she was getting written up for being insensitive to me. Then I smiled and said don't write her up, give her a writing assignment on Lupus. Someone asked me once if I had botox "gone bad" on my face. I was on a high dose of prednisone and was swollen. And I was carrying an oxygen tank in my side. All I could do was cry. This was a co worker too. Our boss gave her an assignment in lieu of getting written up. The assignment was a report on "what is Lupus and how do they treat it"
Among all that I read from other Lupies on the FB Page of Sometimes It Is Lupus, it's hard to say which is the most stupid and which is the nastiest... Very good summary ! Man, each one of these I've wanted to say to at least one person in the last year!